Not a hullo this time I'm afraid! I have been on this forum since July 2003, just beaten by Stockers. Have enjoyed being here, have met numerous great friends, some face to face. Interaction and tips had, over the years, improved my modelling and I trust that my contributions might just have done the same for yourselves. My 3217 posts (2nd only to Steve Bennett) have a % rating that would need to be declared if it involved a quoted company. The last of my Gn15 layouts were sold yesterday. Last Thursday night I saw Consultant who informed me that I had inoperable Cancer of the Pancreas with indications that it had spread. Am seeing top Oncologist next Thursday however tomorrow I have a visit from a Macmillan Nurse as I probably don't have too long on this planet. Within 12 hours of diagnosis I had to visit my GP to obtain morphine. Yesterday I had the skill and efficiency of the NHS demonstrated when I had an extensive MOT checking just about everything to prove all negative apart from the ruddy Pancreas. All within 2 hours & 15 minutes. Doctor involved was a beautiful young lady from the Himalayan country - Nepal. Not many modellers can claim to have had the experience of a Nepalese sticking their Fingers up your £&@. Another visit to my doctor today when I was prescribed a delayed release opiate to help with pain. So with that it's over BUT NOT yet OUT. Gerry broke the news to me the other day. In my turn I reminded him of our trip over to the delights that are the Perrygrove, 2005 I think it was, now almost seeming ancient history. They had the Heywood collection then of course so we had one heck of a grand day out. 3217 posts equates, in my book, to a lot of fun. I'm looking forward to more yet please. Gerry, we never know, do we? Hey short timer (I predate you on the group by about a train length ), thank you for sharing your situation with us. As internet buddies we have all shared the good Gn15 times now we can share in your not so good times. I realize most of us are spread all around the globe so can do little practically to assist you but we certainly can send you positive thoughts and our best wishes. Some years ago I lost my wife and advised one chat group I was on off my loss and I was amazed at the fantastic virtual support I received. I trust we can support you in the same manner. Gerry - I'm so sad to hear this. Hope you are feeling OK with the opiates . Have had several health scares myself this last year or so( 5 so far now), but luckily all mine have turned out to be just scares - can't even imagine what you are going through. Your contributions to this forum have been numerous and informative - thanks for being here and making them. I do hope we hear from you again, but will understand if we don't. sad news, but as years are creeping up on me , I have been looking into future to see where best path is. I will now have to get that old Tuk Tuk model Gerry sold to me, back running. Had it running at RAMMA a couple of years ago, but the Bachmann hirail bus chassis is a useful chassis so one is in something else. There is one spare at the moment. Pity is is too big for my 19by15 mini layout. At least Gerry has managed to pass his models onto those who will appreciate them, something that sadly does not happen if we don't plan it in advance. So sorry to read your news Gerry. I will remember the brief chat we had at Shepton in February and salute your courage and your ability to keep a sense of humour through tribulation. Last edited by MickT on Fri Apr 29, 2016 10:44 am, edited 1 time in total. 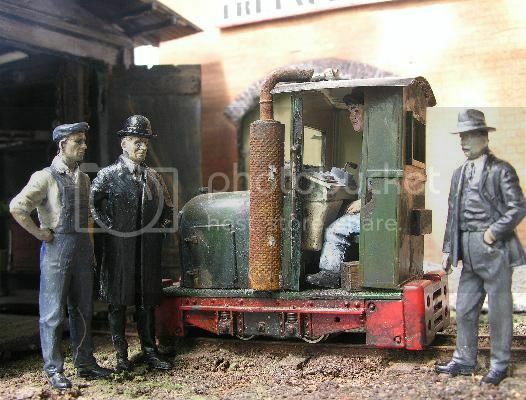 Gerry, your Salenas layout was the first Gn15 layout I saw 'in the flesh', at Pewsey some 10 years ago. We chatted for quite a while and I came away fired with enthusiasm for our scale/gauge. Thank you for all your posts and comments, always worth listening to. Kepp in touch here as long as you can. I am sorry to her this news. I have your Hippy driver and a Bachmann converted ON30 Diesel that I will always cherish. I wish you comfort and godspeed. Many thanks to all for your kind comments, my presence here will be short lived. Oncologist was visited today after being referred by Gastroenterologist. He didn't pull any punches, cancer has spread to lymphs; there are two tumours in Pancreas. Downhill during last week will see the morphine dose increase 3x tonight. Chemo out of the equation not well enough. Will be seeing pain specialist next week. Darn it! I have been reading through all your threads that I could find and am thoroughly enjoying the review. Prayers continue Gerry. I hope that you can be comfortable. Thank you for the update and for everything you have done for the hobby over the years. You have made a LOT of people happy. I haven't been posting here for a while since my modelling cycle has been elsewhere. Funnily enough though I have felt the pull back recently and some of you may have seen my roundy roundy G9 Williams Yard about. I am really sorry to hear of the diagnosis Gerry and have happy memories of our trips to Shepton Mallett together and meetings at shows such as Ely. I know that you have weathered health scares before and wish you all the best. I have very much appreciated your contributions to this forum. Like Chris, I haven't posted for some time as my modelling scales have "drifted" a bit of late. However, you are undoubtedly the Father of the Gnatterbox and have given me much inspiration over the years, both in your postings and personally, as a good friend. 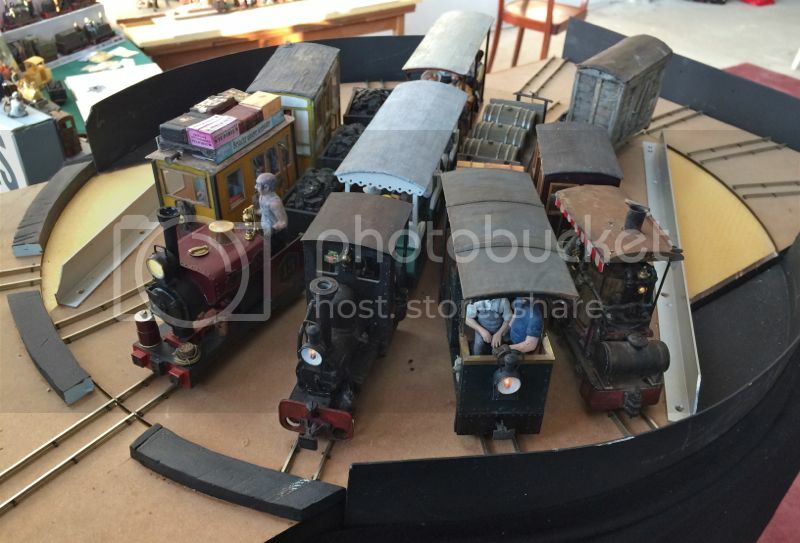 We've seen some times together and I was honoured when you invited me to help with exhibiting the salt pan layout at Brighton Modelworld a few years ago. I'll see you Wednesday. Hang in there mate! In your own immortal words "Not Gnackered yet!" Thank you Gerry, it's been a pleasure to know you. Time to say Thank You to Gerry for all he has done for the Gnatterbox and propbably for the modell railroad fraternity. I have to blame him and Ralph Brammer (Rockley Bottom) for converting me to Gn15 scale many years ago. The first steam loco ever to run in Kraehwinkel for the KEG was his famous red saddle tank loco. Complete with a Carlo Spirito driver. The first one, which ran with battery / RC from various makers. Today with Deltang RC of course. Only recently, while walking along the Salinas at the south tip of La Palma Island I was thinking of Gerry´s layout and of course, whenever I use a rivet, the World Famous Rivet Plantation with Wallace & Gromit sneaks up my mind. So whatever happens to Gerry. His work influenced quite a few of us. Has anyone heard from Gerry or have an update on him? I have spoken to him since my post, but not recently. I check every day to see if he has signed in, but he hasn't since Friday 6 May, which I take as not good news. I have only just come across this really sad news. I met Gerry a couple of times when exhibiting at the same shows. His excellent work and his cheerful self will be greatly missed. I went to see Gerry on the 4th May, when he didn't seem in too bad shape, except very tired, probably as a result of his medication, and I was genuinely hopeful that he might be with us for some time yet. However, I spoke to his daughter a couple of days ago for an update and she said he isn't well at all now. He very kindly passed a lot of his modelling materials on to me, which I will cherish and use in order to attempt to do justice to his talent, to the best of my ability. Thanks for the update Les. Please pass the message if the opportunity comes up. Prayers and thoughts continue. chris stockdale wrote: I have spoken to him since my post, but not recently. Have tried a couple of times but found task too difficult up until today? Now have a bed table that nicely supports my iPad. Apart from CiC, upto 8 hours today, (funded by NHS) I am now effectively bed bound. Last night we had an overnight Carer, (ongoing upgrade) so that my wife could sleep. I ended up only waking once from 10pm to 7am. I remember we met at Expong, a fews years ago, when we were introduced by Chris Krupa. I have since followed your essays into GN15 and been delighted and amused by turns. I'm sorry that you're going through such a trying time but full of admiration for the way your dealing with it. My thoughts are with you and your family. Good to hear from you Gerry. Thanks for making the effort. I wish I could do more, but my prayers continue. Take care. That you for the effort to up date us. I love the comment "Not Gnackered yet!". That saying will probably become another part of the Gn15 legend. All the best and thinking of you.